Today is Dōngzhì Festival or you called it Chinese Winter Solstice Festival (in Chinese: 冬至). One of the important festive celebrations to Chinese. Chinese calls this celebration as Gua Dong (过冬). Normally 冬至 falls on 22nd December, but this year falls on 21st December instead. 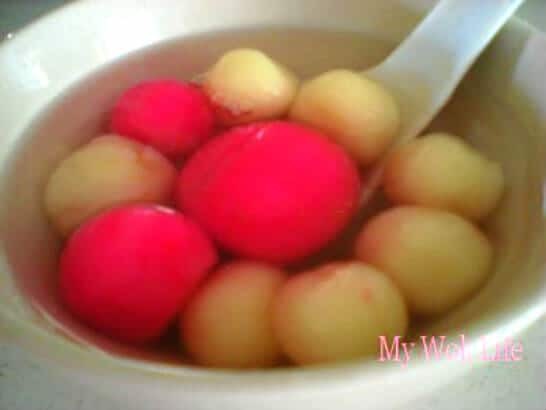 The most essential festive food in 冬至 is Tang Yuan (汤圆) aka Glutinous Rice Ball. 汤圆 symbolizes reunion. Eating 汤圆 together with the family is the best celebration in this festival. Nowadays, many ready-packed 汤圆 are available in supermarket all year long. It comes with ground peanut, sesame and sugar mixture to serve as dipping condiment. Just make the soup will do. It is convenient and suitable especially for young families who prefer more convenience. For a home-cooked taste and greater satisfaction for such important celebration, homemade ones are still the best. 1) Place glutinous rice flour in a clean large bowl. Put some water (in few stages) while kneading the flour into dough, which means mix the flour with a little bit of water, knead and put a little bit of water again. Repeat the step till it becomes dough. The texture of the dough has to be smooth and a little sticky. 2) Split half the dough. Half of it to mix with red colour, while the other half remains white. 2) Take a small lump of dough, put on your palm and roll into bite-sized ball. Repeat step till all complete. 3) To add ground peanut into the rice ball as its filling: take a bigger lump of dough, put on your palm and roll into (size of fifty cents) ball. Then, knead with finger tips to flatten the piece but leave a little well in the middle. Put half teaspoon of ground peanut in the ‘well’, fold it half and knead around the edge to seal it. Tenderly roll it into ball. Repeat step till desired amount of rice balls. Reserve rice balls for later. 4) Boil a pot of water over high heat. Place ginger slices and Pandan leaf bundle into the boiling water. Add rock sugar. Bring broth into a boil again. 5) Place rice balls into the boiling broth. Wait till all rice balls rise to the surface of the broth, when cooked. Heat off and serve. Tips: Colour of the 汤圆 depends on your liking. You may use any other colour, but Chinese prefers red colour as auspicious colour. Alternatively, make Pandan flavour. Pound or blend a bundle of Pandan leaves, squeeze its juice, and mix the juice with the dough (to make Pandan flavour rice balls in green colour). * To know if the rice balls are cooked: rices ball will float on the surface when cooked. hi! thanks for your website. i recently moved from toronto to chile and i just found a chinese grocery store… i miss the chinese food and want to learn how to cook. could you give tips on how to make soup (with shitake mushrooms, dried bean curd, and seaweed), and desserts with white tapioca pearls? thanks! Thanks for visiting my blog. Happy to know you are interesting in Chinese Cooking. I personally do not prefer soup using shitake mushroom and dried bean curd. Those ingredients you mentioned were used in my other recipes, too. E.g. Bak Kut Teh using shitake mushroom, and Red Bean Soup with white tapioca Pearls. YOu may use white tapioca pearls in Cheng T’ng dessert soup, too. Check it out. Looks so good! I wish I had an Asian grocery store nearby so I could buy the ingreients!